The Young Mr on site. Mr Hiwell, the Young Mr and I ventured out to Nassau, New York this weekend to be part of Founders Day Celebration at Eastfield Village. 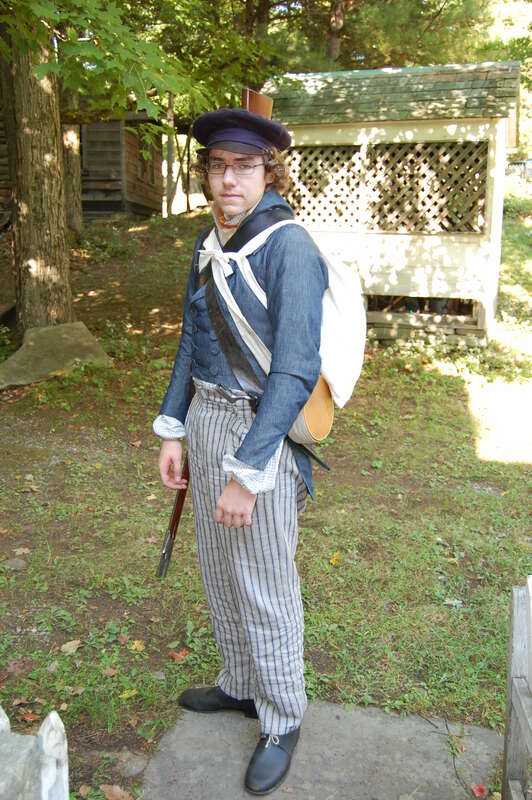 The gents were part of the 1833 militia muster, while I traveled out intending to interpret tailoring with Mr JS, and to provide meals for the militia. It’s an interesting assemblage of buildings, and we were pretty curious about what the site and the experience would be like. While OSV and Genesee are also assembled villages, they’re museums, with different missions and guidelines; they’re also larger, with electricity and flush toilets for visitors and volunteers alike. That means they’re lovely, but not nearly as immersive as the pitch-dark privy experience. The back of the Benjamin Culver house, or, our dining room for dinner. Wear all the patterns possible, please. There was a lot to consider at Eastfield, but I’m tired from driving back and will stick to the simple things for now. 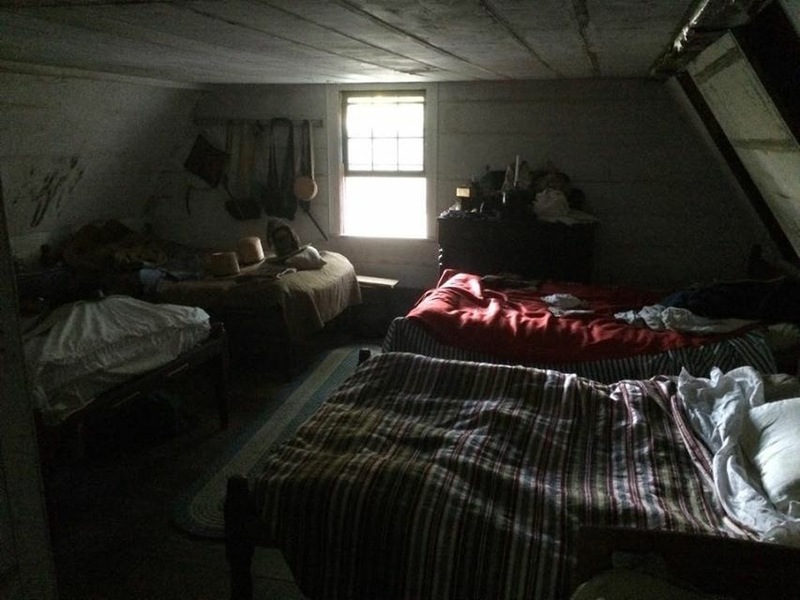 I was incredibly fortunate to have a bed—indeed, the entire 1787 Benjamin Culver house—to myself for sleeping. Friday night, after changing into period clothes, we went up to the Yellow Tavern to eat our supper (pasties brought from home, with hard cider for Mr JS and myself). The candle lit taproom was cozy, and I understand from Mr JS that the sleeping quarters upstairs were even cozier. Cozy is as cozy does. 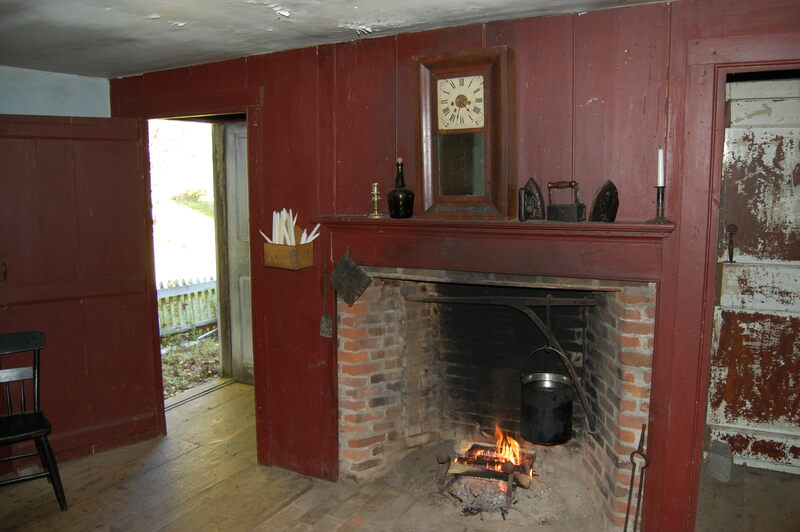 Much of time was spent on women’s work, interpreting daily tasks to a stream of visitors travelling through the house from front door to back, and sometimes upstream. 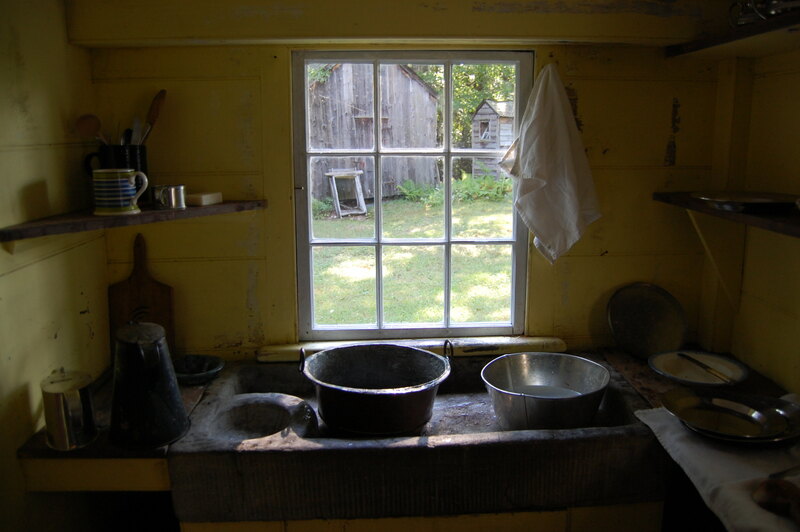 The scullery—for want of a better word—had a soapstone sink which drained through the wall, which made dish washing pretty plush, and provided entertainment for all who cared to witness it. No chickens were present, but from washing dishes at Coggeshall Farm, chickens would have enjoyed the ground beneath that window drain. The view from the scullery: not bad, really. Gentle reader: these stumped me, briefly, until I was able to gather my wits enough to reply, “Yes, it’s a house, built in 1787,” and to assure the visitor that people had, in fact, managed to live in it. The water question was somewhat more perplexing. It’s hard: there’s so much we take from granted in our own daily 21st-century lives, let alone what we become accustomed to when we inhabit the past. Interpreting between the two worlds, things can be lost in translation. I’m always curious about what I’ll learn when I travel to a different century, and I think what I learned, again, was that I find it hard to find a way to interpret women’s lives and work in the past that does not reinforce stereotypes of “life was hard” and “roles were constrained.” Enough! 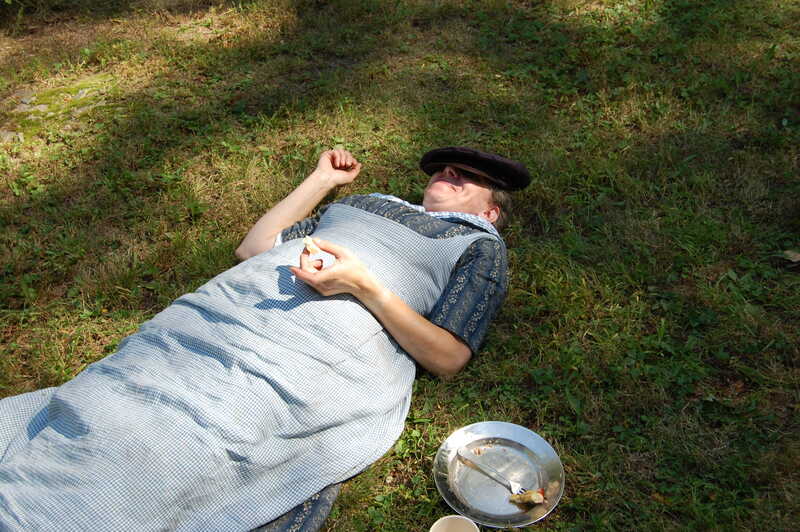 I tried explaining the greater freedom some women enjoyed in the early Federal era, in contrast to the pre-Revolution and post- Great Awakening eras, but that wasn’t entirely successful, and would you believe that story from a woman washing dishes? What I may really have learned is that I’ve done enough time in the kitchen and the scullery; I’d rather be the tavern keeper than the cook or scullery maid. Women were in business, and while never on the scale of partnerships like Brown & Francis, women as merchants, tavern keepers, landlords, and, yes, tailoresses, are underrepresented. It’s easier to talk down the scale than it is to talk up the scale from the washbasin to the shop or tavern, so it’s time to leave the wash basins aside for a bit. Done with dishes for now, thank you. Here here for women in businesses!!! 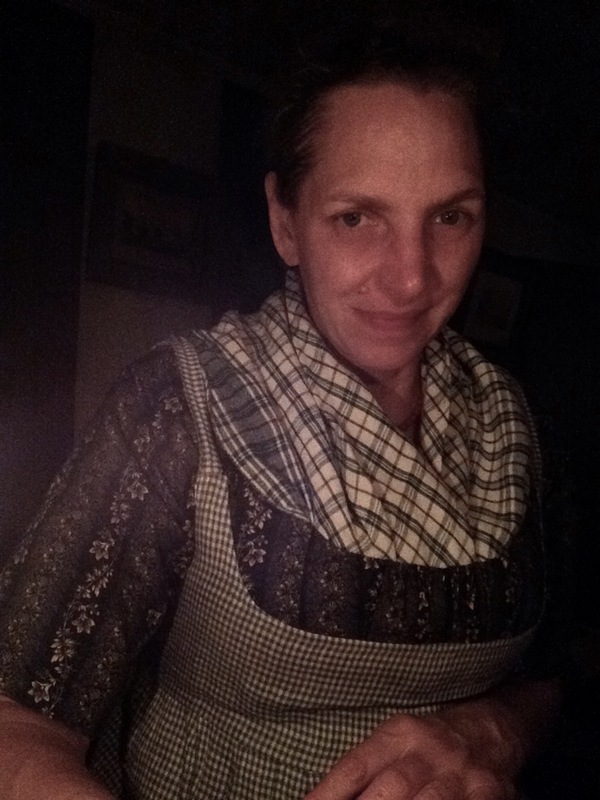 I am part of a group that is a fully functioning 18th century tavern that also has clothing to go in to the 1800 – 1820s. We are the Ox Bow Tavern and I portray the role of tavern keeper’s daughter. It’s great fun to get to cook and wash and sew and serve patrons, but I also enjoy explaining my role to visitors. I love watching their faces light up with that “Oh!” moment of realization. I didn’t know Eastfield was still hosting events! (I had heard the site’s owner passed away.) That’s wonderful! I actually spent a week there when I took my shoe making workshop a few years back. 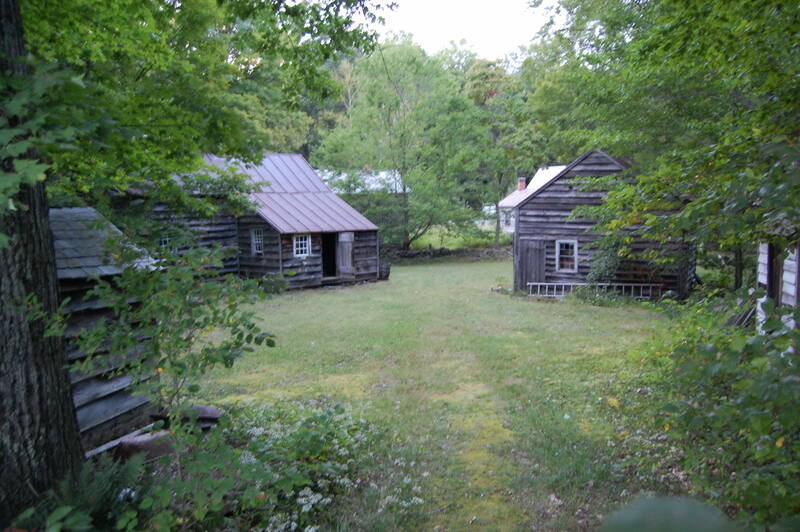 About a dozen of us stayed in the large William Briggs Tavern, we cooked all our meals in the kitchen there. Such an amazing experience on top of a great workshop. By the end of the week the place really did start to feel like home. Hoping I have a chance to go back some day. Yes! More roles for women! Even in remote places, far from cities, women could and did do many jobs. Wives of fur trappers, for example, had to hunt and repair homes and manage farms alone for years at a time (along with all the usual household chores). How often do we show that? My most burning question, though, is far more mundane: How the heck do you put on your kerchief and keep it in place?? I find the things continually creeping about and pulling out of my neckline, even with the help of pins. What’s the secret? Sorry about the delay– much happening IRL. The linen handkerchief just stays put in 1812ish clothes; it is also tucked into the gown behind the lining flaps. For 18th century, I pin the thing to my gown. Problem solved.